WASHINGTON — Builders of satellite antennas disagree on whether flat panel antennas — widely considered a necessity for planned broadband megaconstellations — can be produced cheaply enough to address the mass consumer market in the near term. Antenna makers say so much enthusiasm exists for such antennas that sorting fact from wishful thinking among buyer expectations and seller claims has become a difficulty all its own. High-tech, flat panel antennas that can track multiple satellites at once while taking up less space than traditional dish antennas are a different story. Flat panel antennas have historically been so expensive that only militaries have made regular use of them. Over a dozen companies, each with a technology breakthrough of their own, are trying to change that narrative by building flat panel antennas cheaply enough that consumers and businesses without deep pockets afford them. Progress is proving slower than industry demands, however. “We’ve all heard the crazy requests from some operators asking for millions of antennas for multiple hundreds of dollars,” said Drew Klein, director of international business development at C-Com Satellite Systems, a company that builds dish antennas and is working on a flat panel antenna with the University of Waterloo. Such prices are achievable “within the next decade” — and have to be, he said, in order to address new markets. The average price of a new car in the U.S. is $35,000, according to analysts at Kelly Blue Book. Even for buyers of high-end luxury cars, which cost $96,000 on average, a $20,000 to $40,000 antenna would be an expensive add-on. Some antenna companies, like Israel-based Gilat Satellite Networks, are focused first on building flat panel antennas for customers who are willing to pay higher prices than consumers. Nir Sharvit, Gilat’s director of radio-frequency integrated circuits and antenna technologies, said the company has developed a new chipset for a flat, electronically steered antenna, but views aeronautical and corporate institutions as go-to customers. Satellite operators — even those with fleets of more traditional geostationary communications satellites — have complained that slow progress in antenna technology is holding back their growth. Many antenna companies are investing in flat panel antennas as the next big breakthrough, but not all are convinced it’s worth the effort. “I think we are a long ways away from seeing a consumer flat panel antenna in the couple-of-hundred-dollars price point, which is where it needs to be to compete with consumer terminals that we have today for [high-throughput] satellites,” said Andre Jones, Communications & Power Industries (CPI) vice president of business development. CPI of Palo Alto, California, is not involved in flat panel antennas but is still using dish antennas to court low- and medium-Earth-orbit satellite systems, he said. To win their business, CPI is focused on making antennas that track very precisely with non-geosynchronous satellites as they move across the sky, while also making them easy to install and deploy. “I don’t see the parabolic dishes going away anytime soon,” he said. Stationary dish antennas work well when pointed at satellites 36,000 kilometers up in geostationary orbit where, relative to the ground, they appear in a fixed location. Satellites in lower orbits move across the sky, requiring antenna systems that can track their movement as satellites rise and set. In the absence of commercial flat panel antennas, SES has been forced to rely on two dish antenna systems with mechanical steering to keep constant links with O3b satellites in 8,000-kilometer medium Earth orbits, but this approach is very expensive. “All of the O3b customers I’ve ever spoken to, the one thing that they complain about is not O3b itself, not the level of service — they love the low latency, all that kind of stuff — they just hate the antennas, because they are always breaking down one way or another, so they have to have redundant antennas, and they are not cheap,” said Susan Bull, a senior consultant at Comsys. Bull said O3b customers are paying $250,000 for O3b antenna systems — a figure Rao, who worked at O3b before the company was purchased by SES in 2016, said is not typical. “If you build up the entire site, yes, it could maybe go up to there,” he said, factoring in the cost of signal converters and spare units. Rao declined to give specific prices for O3b antennas at the VSAT Congress, as did one of O3b’s suppliers, AvL Technologies of Asheville, North Carolina, at the Satellite Innovation conference a week earlier. Tony Wilkey, AvL Technologies senior vice president of corporate sales, said the company is “sticking our toe in the water” with flat panel antennas through projects funded by the U.S. government. SES is working with three companies, Alcan Systems, Isotropic Systems and Viasat, to build flat or low-profile electronically steered antennas for O3b mPower, its next-generation satellite system, which is slated to launch in 2021. Darmstadt, Germany-based Alcan Systems has stated the goal of selling business-grade flat panel antennas for under $10,000 each, and consumer-grade antennas for under $1,000. John Finney, Isotropic CEO, said his company is making progress on an antenna designed to fit within a $300 to $700 price range stipulated by OneWeb, the low-Earth-orbit broadband venture whose first 10 satellites are expected to launch in the coming months. “We fit within that price envelope, so we are pretty confident,” he said. 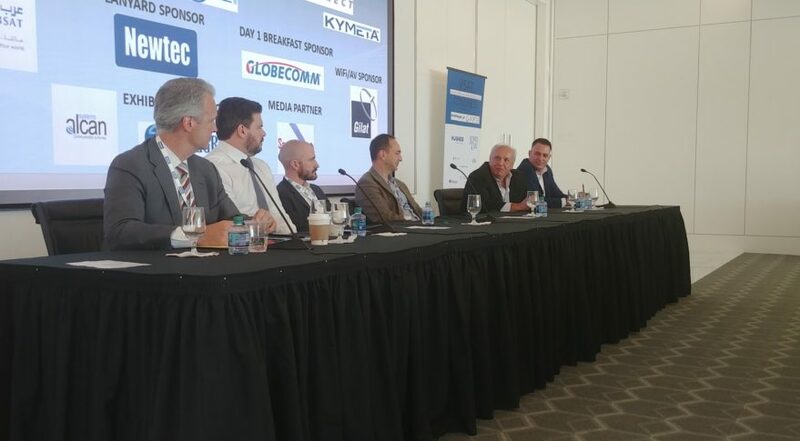 Sibay said there exists a lot of “healthy skepticism” in the satellite industry around commercial flat panel antennas, as product deliveries are chronically years away. Alcan System’s own antenna has slipped from a 2018 release to 2020. Kymeta of Redmond, Washington is the first company to release an electronically steered, flat panel antenna, having begun shipments last year. CEO Nathan Kundtz said Kymeta is finding early adopters among mega-yacht owners, first responders and niche government users where traits like antenna size and looks are of high value. Kundtz said the next markets in Kymeta’s scope are recreational vehicles, buses and trains — markets he acknowledged as “far more price sensitive,” but also largely untapped by the satellite industry. Kymeta antennas are priced up to $39,000 today, though the company plans to drive those prices down to below $1,000 through volume. Kundtz didn’t give a timeframe for that, however. Phasor’s first flat panel antennas debut early next year after some seven years of development, Helfgott said. The U.S.- and U.K.-based company is not building antennas for consumers, focusing instead on business and government customers that can afford Phasor’s mobility-focused products for sectors including aviation, maritime and rail transportation. Helfgott said he expects different flat panel antennas will succeed in parts of the market, but that no one-size-fits-all antenna will take the industry by storm.